I.VA.CO. srl is now a registered brand. The company brand is a set of words and symbols that distinguishes a distinct company in order to differentiate it from the competitors. It is the main tool through which customers can identify a specific product and recognize its quality and peculiar characteristics. Since the brand is one of the most important resources, I.VA.CO. 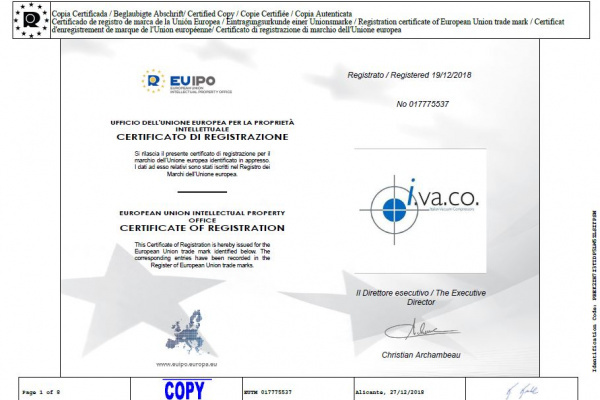 has decided to register it at EUIPO (European Union Intellectual Property Office). This process has allowed to apply the ® symbol that makes the brand registration immediately visible by preventing the improper or not authorized use of the brand by other companies together with other legal protections. 7: Industrial pumps, compressors and fans; Air diffusers; Liquid ring vacuum pumps; Vacuum pumps and dry sliding vane compressors; Oil-flooded rotary blade compressors and pumps; Side-channel aspirators and compressors; Lobe aspirators and compressors; centrifugal and axial blowers; Membrane disc diffusers; Tubular membrane diffusers; None of the aforesaid goods being intended for land vehicles; Commercial vehicles; Motor buses; Shuttle vans; Motor coaches, lorries; Motors and engines for land vehicles, commercial vehicles, motor buses, minibuses, motor coaches, lorries; Parts and fittings for the aforesaid goods. 11: Extractor fans; Ventilating fans; Air diffusers; Membrane disc diffusers; Tubular membrane diffusers; None of the aforesaid goods being intended for land vehicles; Commercial vehicles; buses; Shuttle vans; Motor coaches, lorries; Motors and engines for land vehicles, commercial vehicles, motor buses, minibuses, motor coaches, lorries; Parts and fittings for the aforesaid goods. 37: Maintenance, repair and servicing of; All of the aforesaid relating to air diffusers, pumps, compressors, fans and aspirators, and parts therefor; None of the aforesaid services being intended for repairing land vehicles, commercial vehicles, motor buses, minibuses, motor coaches, lorries, Parts and fittings for all the aforesaid goods; For maintaining land vehicles, commercial vehicles, motor buses, minibuses, motor coaches, lorries, parts and fittings for the aforesaid goods; For installation services in relation to land vehicles, commercial vehicles, motor buses, minibuses, motor coaches, lorries, parts and fittings for the aforesaid goods; For technical support in relation to repairing vehicles (repair); For support in relation to vehicle breakdown repair services (repair).